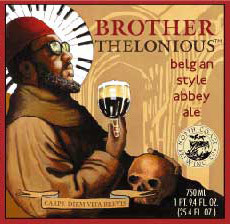 The brother pours a dark brown color, chestnut-like, into a hazy body that clears as it settles. Its crowned by a fizzy, light-brown head with decent retention and fair lacing. Aroma is similar to that of a wheat wine, much like brown sugar and maple syrup. The first taste is heavily sweet, that gently gives way to a faint bitter finish with gentle carbonation. Medium-bodied, it has a creamy texture with soft carbonation, and despite the high alcohol level, the alcohol doesn't reveal itself, instead masked by the heavy sweetness that coats from the first taste and doesn&apos;t move out of the way.